Roasted cauliflower and chickpea salad was really the only way to go after my last recipe post. Which, let’s face it, was pure gluttony on a plate! I’m all about the comfort food right now but sometimes I need to reign it in a bit so my jeans still fit. I unfortunately do not posess the speedy metabolism that I desire. These beautiful cauliflowers have been calling out to me for the last few weeks. Every time I pass the greengrocers, they are always there looking beautifully pretty and very jewel-like. 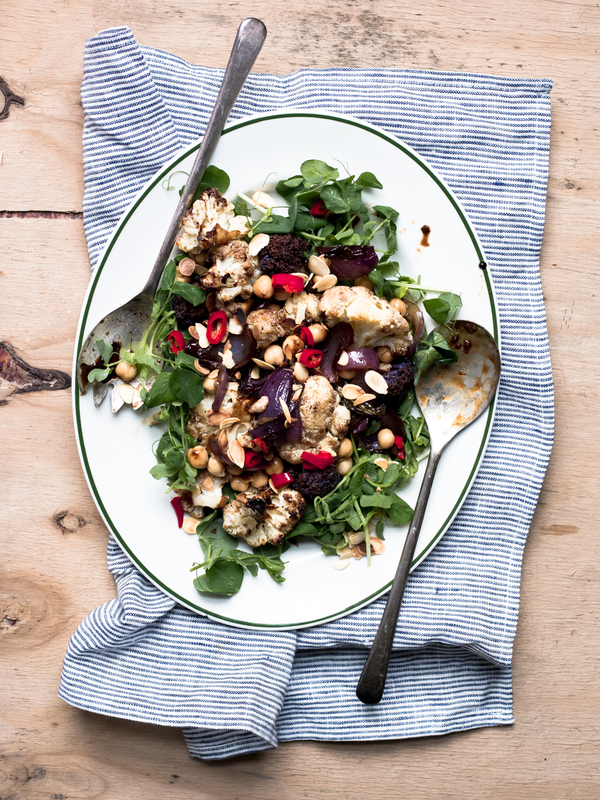 If you don’t rate cauliflower all that much, give roasted cauliflower a try. Us Brits have a history of boiling our veg until bleak and flavourless. Roasting holds onto more of the flavour and it’s so easy to introduce other tasty ingredients along the way too. 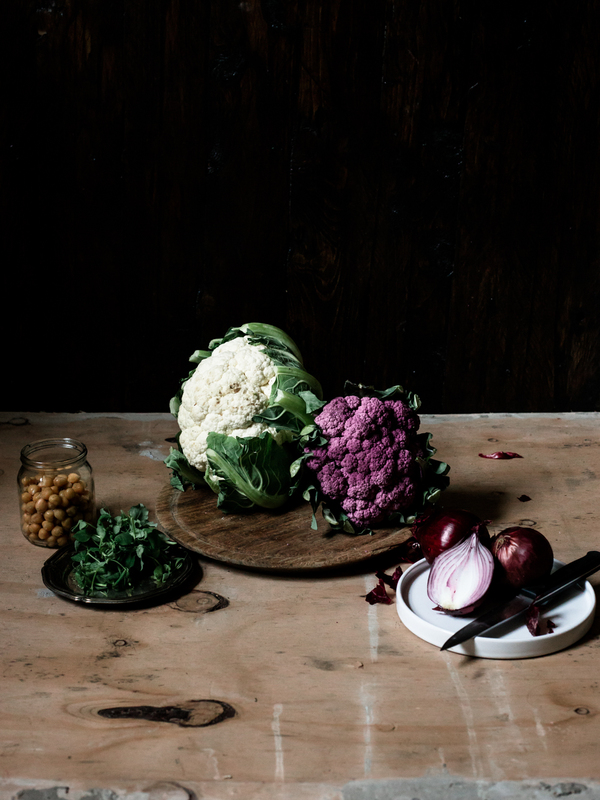 I’ve been enjoying roasted cauliflower as a side dish for some time now, with so many different flavour combinations. I stumbled across this one on the BBC Good Food site and the more I came back to it, the more it evolved into a fuller salad dish of my own. I usually serve with flat breads or pittas if I’m feeling hungry, which let’s be honest – is usually the case! 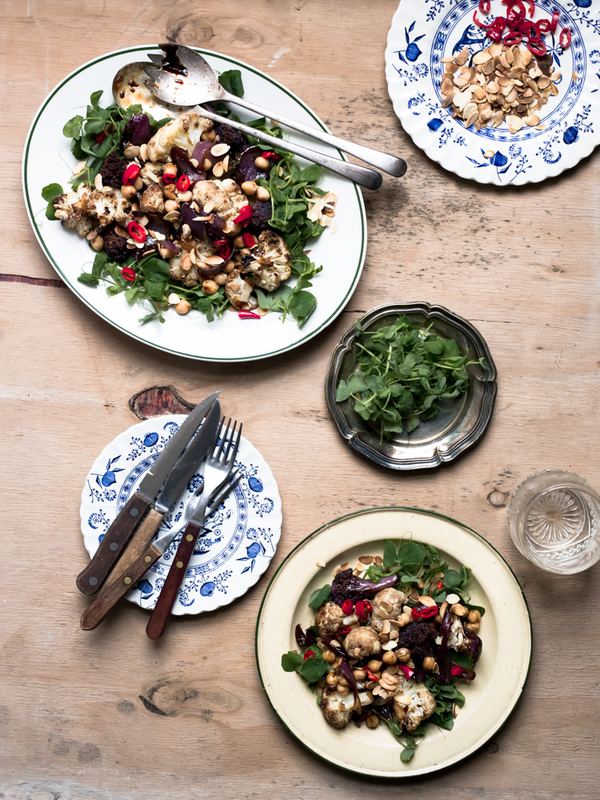 I’m becoming increasingly fond of this style of vegetarian cooking, it very much reminds me of an Ottolenghi dish. I’m constantly inspired by his vibrant cooking and take on vegetables, he always manages to turn them into something spectacular. Anyway, I’ll save my Ottolenghi praise for another day, that’s a whole post in itself! As you can probably tell, I’ve gone for a white cauliflower and a purple cauliflower for variety. The purple is said to be milder and a little sweeter in taste, though I don’t know how much that holds up after combining with a few other flavours. You can also pick up a vibrant green variety, otherwise known as Romanesco. It’s really up to you how you mix and match. Don’t worry if you can’t find the different varieties either, just stick with white cauliflower if need be and everything else will surely make up for it. 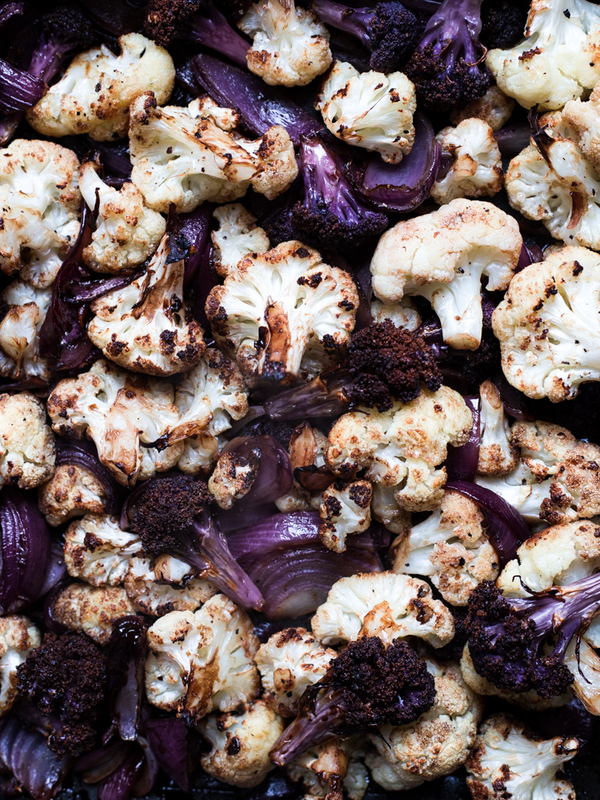 Have you tried roasted cauliflower before? I’d love to hear what you pair it with if you have!